Shinzo Abe’s aggressive pursuit of stronger ties with India provokes China and Delhi needs to muster great political will and diplomatic dexterity to navigate the relations with Japan. The return of Shinzo Abe as Japan’s prime minister has rekindled the hopes of a renaissance in India’s relations with that country. He held out big promises of a golden age in Japan-India relations in his first term six years ago, but they were largely unfulfilled. Nonetheless, Abe is back, he is still highly regarded in Delhi and “Abepolitik” has a perennial appeal to the Indian pundit’s nationalistic sensibility. However, Abe’s aggressive pursuit of stronger ties with India provokes China and Delhi needs to muster great political will and diplomatic dexterity to navigate the relations with Japan. Abe’s agenda is two-fold: bilateral engagement with India and trilateral cooperation alongside the United States. The US, Japan and India have formed a trilateral format of consultations on regional problems at the foreign ministry level. Abe has a master plan. He is leading Japan into a formal relationship with the North Atlantic Treaty Organization as well. Indeed, the US also visualizes India as the “lynchpin” of its rebalancing strategy in Asia. All said, a whole new coinage has appeared in the strategic discourses – “Indo-Pacific,” which has a connotation that the US, Japan and India belong to a common strategic space. The unspoken theme that brings the three countries together is of course the rise of China. Without doubt, China is a focal point for Abe in the expanding framework of strategic partnership with India. India has been playing it cool and a delicate game of hedging was on. The overarching interdependency in the US-China relationship would make India cautious about joining hands with Abe’s project. At any rate, both the US and Japan also happen to have fulsome relationships with China and Abepolitik meets with opposition within Japan itself. 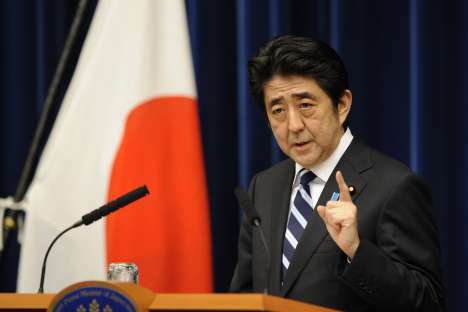 Abe’s mandate is primarily to regenerate the Japanese economy, whereas the majority opinion opposes militarism. Delhi’s preference has been – and should continue to be – to leverage the relationship with Japan to secure an optimal position in negotiations with China, a game that the mandarins in Delhi have perfected over the years. But the big question is whether all that may be about to change. The recrudescence of border tensions in Ladakh following China’s troop incursions in mid-April has changed the alchemy of regional politics. The anxieties regarding Chinese intentions gnaw at the Indian mind and the pundits in Delhi are clamouring for a concord with Japan and the US. Against this backdrop, the 3-day visit of Prime Minister Manmohan Singh to Japan last week became a defining moment for India’s regional policies. Undoubtedly, Abe is charioting Japan toward an expansionary phase economically and strategically and Delhi is keen to partake of it. Beijing reacted with alacrity to Manmohan Singh’s words. The new cadence in the Indian voice has registered in Beijing. The ruling Communist Party’s mouthpiece People’s Daily lashed out at Japanese leaders, terming them “petty burglars” trying to cash in on the transient India-China disharmony. The government-owned China Daily warned Delhi from cozying up to Japan. The Global Times newspaper noted that India and Japan are close to signing a deal to supply amphibious US-2 planes to India and that it would mark a strengthening of the alliance between Japan and India in terms of defence and military cooperation. The daily accused Japan of trying to take advantage of the border tensions between India and China and to contain the latter with the possible military sale. But having said that, it is unrealistic to exaggerate the actual state of play in the India-Japan relations. The economic content of the relationship remains far below potential and there are no signs of any big Japanese investments. The Japanese businessman continues to remain reluctant to plunge into the Indian market – unlike his South Korean and Chinese counterpart. He has numerous complaints about the difficult Indian conditions. During Manmohan Singh’s visit, Japan officially signed off on a $700 million loan to build a metro in Mumbai. Japan has shown interest in supporting the introduction of high-speed railway system in India and to push the sale of its shinkansen bullet trains. The Japanese offer runs into similar offers by France and China. The two countries are also working together on other infrastructure projects including a $90 billion, 1500-kilometre railways project that also includes airports, freeways, ports and a power plant known as the Delhi-Mumbai Industrial Corridor. Abe has successfully wooed India by resuming negotiations for an agreement in nuclear cooperation despite the debris of Fukushima. The Japanese nuclear-power builders Hitachi and its US-based international nuclear business venture have been active in India. In comparison, Toshiba and Mitsubishi have shown reluctance in entering the Indian market. Everything depends on the conclusion of the nuclear agreement. During the Indian prime minister’s, the two sides agreed to accelerate the negotiations. But the criticism within Japan about nuclear cooperation with India, a non-signatory of the Nuclear Non-Proliferation Treaty, is still palpable. On the eve of Manmohan Singh’s visit, Asahi Shimbun wrote a highly critical editorial arguing against nuclear cooperation with India unless it signed the NPT. The point is, China is way ahead of Japan as an economic partner for India both in trade and investment. Besides, Beijing isn’t far behind Abe in wooing India. The new Chinese leadership made an extraordinary gesture by picking India for Li’s first visit abroad as premier. Li offered a “handshake across the Himalayas” to the Indians during his 3-day visit and proposed a “strategic consensus and cooperation” between the two countries. Delhi chose to mull over it but is far from disinterested. National Security Advisor Shivshankar Menon will be visiting Beijing in coming days, followed by Defence Minister A. K. Antony and Manmohan Singh himself. There is scope for India and China to ponder over together as to what happened on the disputed border and to negotiate the irreducible minimum needed to preserve mutual trust in relations. The bottom line is that Beijing appreciates that it is not in India’s DNA to jettison its independent foreign policy and to be shepherded into alliances and blocs. Suffice to say, it is largely up to Beijing not to drive Delhi into a Japanese and/or American embrace.